I hope you all had a great weekend! Mine was fun-filled and relaxing, with one night spent playing this addicting game called “Scattegories.” If you haven’t heard of or played it, you must, must, must! You think it will be easy when starting out, but boy does it get challenging (it literally made my heart race faster each round). The rest was spent studying and relaxing. Today has gone by quite slow and fast – yes, both. It’s so strange when I look at the time and think “oh, great. it’s only 4pm”, but then (what I feel is a minute later) “wait… it was JUST 4pm! How is it 5? !” I guess I have a case of the Mondays… hopefully it doesn’t stick like this for the rest of my week! I did get a lot done though, which always feels wonderful, especially since one of my resolutions for the year is to be and stay productive! My internship with Blueprint for Style is going fantastic so far. To discover more on it, follow my Twitter @FearlessBfS, check out our Blog, and fan the Facebook page! 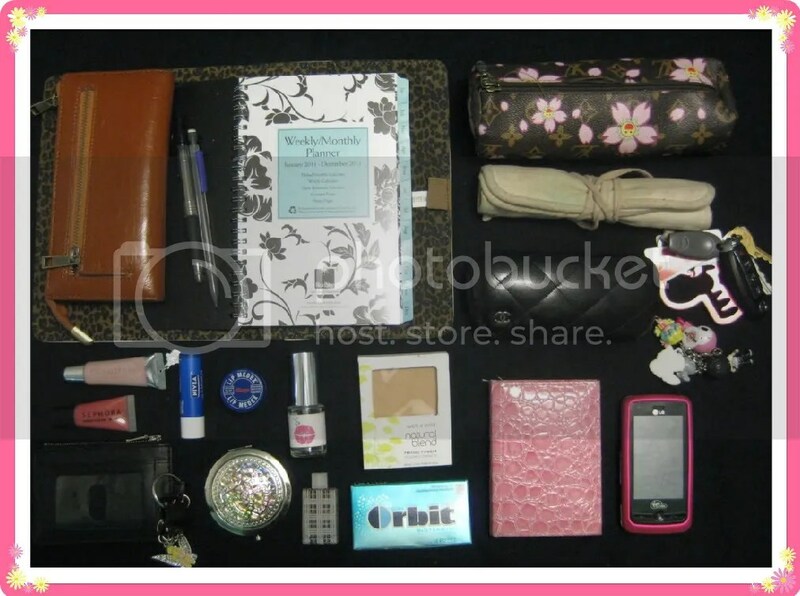 I’m not going to sit here and say this is the most original or even most interesting post, but I for one have always been intrigued if/when I stumble upon one of these: the ones where bloggers showcase a brief peek on their personal lives… even so personal and far as what resides in their purses! To some, this may be a basic bag that you may even carry the same (or similar) items in; and to others, I’m sure it looks as if I carry loads. Although I’ve told myself many times that I need a smaller purse, I feel I always settle on larger ones. I feel it’s better to be safe than sorry, in-case I unexpectedly need more space! Lately (and for quite some time now, since I haven’t gotten around to purchasing a new one), I’ve been carrying my Betsey Johnson Betseyville Tote: it fits A LOT, and by a lot I mean it takes me a while to dig through it to get what I want (one of the reasons why I need a tall, rather than wide, bag! The deep sides can get a bit frustrating but oh well!) 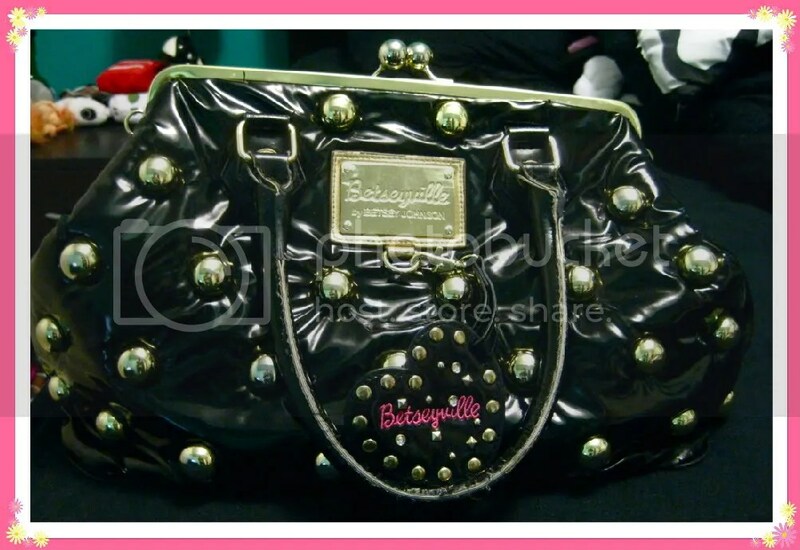 Nonetheless, I love, love, love this bag and will forever cherish it. First (and most obvious) is my wallet, purchased from Urban Outfitters a few years ago on sale for only $4! I’m really particular on wallets, since I don’t like to be fidgety when taking out money/credit cards/etc: it must have enough compartments to separate everything from cash, checks, cards, and personal identifications. This one came with that plus snap-on mini-wallets to hold my coins! So cute. Underneath my wallet is my daily planner which I am addicted to! I buy a new one every year (from Target) and slip it into this soft, “folder” which came with a planner I had years back. I always carry my make-up bag and brushes with me, even if I don’t use them (I also put bobby-pins, hair ties, and hair clips in there, too). I don’t like my bag feeling too empty, so I just stuff things in there, heh. I usually have a friend or two who ask to borrow something, and I most likely end up having it, so that’s handy! The pink case next to my Rumor Touch Cell Phone (with the many phone charms on it), is this amazing all-in-one make-up kit: comes with a mini mirror, various shades of eyeshadows that would match practically any outfit and tons of lipglosses. I’m in love with it! Everyone should own something like this to avoid carrying tons of make-up in their bag. The Rest: Chanel glasses, keys, wet n wild natural blend pressed powder, Orbit gum, Betsey Johnson perfume, Burberry perfume, mirror, Nivea chapstick, Blistex chapstick, Sephora pink lipgloss (not sure what color, it came in a mini-gift set for my birthday! ), mini-wallet filled with membership cards to various stores. Have a great night! For me, it’s studying, 90210, and Gossip Girl! What must you carry in your bag? Tasty Tuesdays: Pretty in Pink!